The Packaging Aids Corp. Fresh PAC Vacuum/Gas Sealer is uniquely suited to the needs of the fresh food industry as it can be used in both wet and dry environments. This USDA approved stainless steel sealing machine is designed for vacuum and/or modified atmosphere packaging (MAP) of fresh foods such as produce, meat, poultry, nuts, baked goods, spices and pasta. There are many features that make the Fresh Pac ideal for fresh food packaging. Wide stainless steel profiled nozzles facilitate faster air removal and allow easy entry into and out of bags. The Cleaning System is valuable when using wet products. The Cleaning System includes easily removable nozzles, special pass through Venturi vacuum pumps and food trap with automatic evacuation at end of each cycle. The vacuum line can be back flushed with chlorine or other cleaning agent (optional). The electronic controls for vacuum, seal and cool are mounted in a Nema 4X watertight enclosure above the seal head. A pneumatically controlled and watertight foot switch allows operator to initiate vacuum cycle. The Fresh Pac has a stainless steel frame with rear wheels for easy station-to-station mobility. The sealing head is adjustable with three position height adjustment, as well as movement from a horizontal to a vertical position, for more convenient ergonomic operation. Download P.A.C. Fresh Pac Vacuum Sealer brochure (pdf). P.A.C. 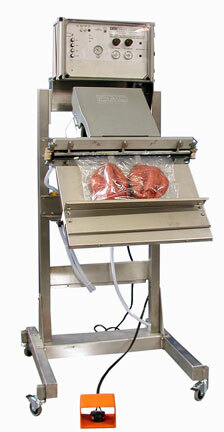 Fresh Pac PV-G18 Vacuum Bag Sealer. To Order, enter the quantity needed beside each item, then click the "Add to Cart" button. FOB: San Rafael, CA. Machines usually ship in 6-8 weeks ARO.